Scroll down to see the top not-for-profit colleges and universities in Nevada offering online degree programs. The online program at the College of Southern Nevada is one of the 50 largest in the United States, according to The Chronicle of Higher Education, and enrollment increased more than 10 percent in just three years to about 15,000 students in 2015. The college has about two dozen degrees and certificates that can be completed entirely online, and to support the large number of online students, Southern Nevada offers more than 1,000 online courses each year. All the courses use the college's standard semester schedule and are offered in an asynchronous format for maximum flexibility. Most of the online degrees are transfer degrees. Located in rural Nevada, Great Basin College was a pioneer in distance education just to reach students in the counties it was created to serve. Now, the college offers dozens of online programs and serves online students from around the country as well as those from Nevada. Online offerings fall into three categories: bachelor's degree, associate degree, and certificate. Bachelor's degrees include a degree-completion program for nurses and Bachelor of Applied Science degrees that emphasize career studies. Associate degrees are available for transfer students and those seeking career skills. The certificates of achievement are shorter versions of the career associate programs, allowing students to take their new skills to a job quickly. The WebCampus at UNR offers more than 200 online courses each year to undergraduates and graduate students. The College of Education offers the following online Master's degrees: Master of Science in Equity and Diversity in Education, Master of Education with an emphasis on Educational Psychology, Master of Education in Literary Studies and Master of Science with an emphasis in Information Technology in Education. An Executive Masters in Business Administration and a Master in Justice Management can also be pursued online. WebCampus has an online graduate certificate program (Graduate Certificate in Renewable Energy) as well as an online doctoral program (Doctorate of Nursing Practice). Blackboard is the learning management system used by WebCampus. 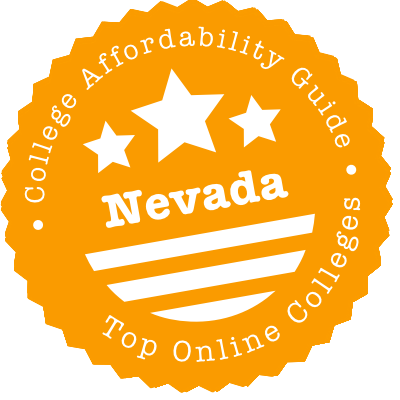 Nevada’s colleges host a growing assortment of online degrees and courses. We’ll help you sort through them, pointing you in the direction of cheap credits, affordable community college programs and tuition discounts. We’ll also tell you which online school met our standards for quality and affordability, as well as which schools you might want to avoid. If you’ve still got time left in high school, now is the perfect time to start earning an online undergraduate degree in Nevada. Why? A pair of state-run schools — Great Basin College and Western Nevada College — run cheap online programs for high schoolers looking to accumulate college credit. Whereas other schools, including UNLV and Truckee Meadows, charge high schoolers standard tuition and fees, GBC and WNC charge $50 per online class. That’s a really affordable way to pick up college credit! Another route to scoring cheap college credits is to take Advanced Placement (AP) courses in high school and score well on the subsequent exams. In many parts of the country, AP classes are a standard component of a secondary school schedule, but in rural Nevada the pickings can be slim. To accommodate students, the Nevada Department of Education has approved multiple online high schools. Most require full-time enrollment, but one — Northeastern Nevada Virtual Academy — allows part-time students, meaning you can dip into online AP courses as needed. Going to a public two-year college is a great way to save money. Community colleges are typically cheaper than the four-year alternatives, and they’re designed to get you out with the general education credits you need to start a baccalaureate program. In Nevada, look to a duo of schools with online programs: College of Southern Nevada in Las Vegas and Great Basin College in Elko. Western Nevada College in Carson City and Truckee Meadows Community College in Reno also have individual online courses and/or certificates. To get a sense of what courses you should take, use the Nevada System of Higher Education’s (NSHE) common course number search. Select your chosen college and/or discipline and see which courses are transferable to other NSHE institutions. The Western Interstate Commission for Higher Education (WICHE) is composed of 15 states, all of whom participate in two tuition reciprocity programs. WICHE’s Western Undergraduate Exchange (WUE) caps tuition for WUE state residents attending participating colleges at 150% of the in-state rate. For master’s students, the Western Regional Graduate Program (WRGP) makes nonresident and resident tuition equal, but the qualifying programs are skewed toward on-campus. Does Nevada participate? You bet. All seven public institutions under the NSHE — College of Southern Nevada, Great Basin College, Nevada State College, Truckee Meadows Community College, UNLV, UNR and Western Nevada College — take part. Want a degree outside Nevada? WUE-participating institutions in other states will honor that good rate as well. We evaluated all the colleges in the Silver State on criteria including quality, flexibility, price, and use of financial aid money. One school made both our “Top Online” and “Most Affordable” lists. To compare our pick with other colleges in the state, go to College Scorecard. It publishes tons of info on things like graduation rates and debt loads. The most straightforward avenue to discovering UNR’s online degrees and courses is via its 365 Learning program, which is charged with running the school’s distance degrees and courses. If you’re taking a mix of online and on-campus coursework, inquire about the Nevada Advantage or Western Undergraduate Exchange tuition discounts. Both are for students from WICHE states and territories, but the latter is worth more. Which one you get depends on your incoming GPA and SAT/ACT scores. Full-time online learners from out of state needn’t worry about such details: the distance education fee for nonresidents is the same as the WUE rate. Where they can really score is with summer session courses. Taking courses in the summer means getting a degree faster. Plus, there’s no out-of-state tuition for such courses! For details on all tuition and fees, see the Cashier’s Office webpage. Then check out the Office of Financial Aid & Scholarships for grant, scholarship and loan information. The Northwest Commission on Colleges and Universities (NWCCU) is the regional accrediting body for Nevada. Students at NWCCU-accredited schools can apply for federal and state financial aid and can typically transfer credits between institutions. Take a second to peruse NWCCU’s Directory of Nevada Institutions. All schools on this list are NWCCU-accredited, but look under the status column to make sure there are no negative actions such as a “warning,” “probation,” or “show-cause.” NWCCU gives warnings for minor infractions and provides detailed explanations for probation or show-cause notices, which are more serious. Carrington College in Las Vegas is just one branch of a for-profit chain accredited by the Accrediting Commission for Community and Junior Colleges, a regional accreditor for the Pacific region. The Federal Trade Commission sued Carrington’s parent company, DeVry Education Group, in 2016 for deceptive marketing practices related to its DeVry University branch. The group settled the lawsuit for $100 million. Speaking of DeVry University, it also has a branch in Henderson. Based out of Illinois, DeVry University campuses are accredited by another regional agency, the Higher Learning Commission. In 2016 DeVry settled a $100 million lawsuit brought against it by the Federal Trade Commission for misleading the public about graduation rates and student employability. After several Everest campuses posted staggering financial losses in 2016, the Accrediting Council for Independent Colleges and Schools, a national agency, placed them on show-cause, meaning they would have to provide evidence of why they should remain accredited. It removed the schools, including the Henderson branch, from show-cause by the end of 2016 and placed them on “financial reporting.” Everest College must submit comprehensive quarterly financial reports to demonstrate it is on the right track. University of Phoenix is a for-profit chain of schools holding regional accreditation through the Higher Learning Commission. Still, take a second look at the statistics. According to College Scorecard data, Phoenix’s Las Vegas branch reports one of the lowest graduation rates in Nevada, which might not be so troubling if student costs weren’t higher than the national average. Before you get too excited, Walker University is a diploma mill offering phony degrees (which are illegal to use in several states). Its Carson City address is also fake, so there’s no telling where the scam is actually based. Northwest Commission on Colleges and Universities (NWCCU): Nevada’s regional accrediting body informs the public of each action it takes, including when it sanctions a college. Check that your school is on its list and in the clear. Nevada Department of Education: K-12 students can see whether the department has approved their school district or charter school to provide distance education. Nevada System of Higher Education (NSHE): Go through NSHE to connect with any of the state’s public degree-granting institutions. Of particular interest for transfer students is the section on common course numbering. Northeastern Nevada Virtual Academy: This is just one of the state’s many online high schools where students can take Advanced Placement classes. It’s unique because it accepts part-time students. Western Interstate Commission for Higher Education (WICHE): Through the Western Undergraduate Exchange, you can receive a sizable discount as a Nevadan attending other Western colleges — or as a resident of a WICHE member state attending a Nevada college.